Getting real clear and very public about what I am up to has given me laser focus. It has been my experience when you are very clear about what your purpose is, the universe conspires to help you and opportunity just naturally comes your way. In fact, the universe sends you opportunities you were not even looking for. On March 29th I was introduced to Bruce Raskin. Bruce and his wife Kimberly own Raskin & Associates. Five months prior, they had purchased Spanish Village in Carefree, Arizona. Spanish Village is an original commercial building structure full of character and history. At the time the Raskin’s purchased Spanish Village, it was 75% empty. Brave investment! The Raskin’s are very committed to bringing Spanish Village forward as a successful, completely occupied commercial oasis that is full of local atmosphere in the town of Carefree. I had gone out to eat at Alberto’s the night of the introduction before I spoke to Bruce. Alberto’s is just around the corner from Spanish Village, and is a venue I highly recommend—the food is FANTASTIC and Alberto is the real thing! I drove over to the Spanish Village site out of curiosity, mostly to take a peak. As I approached in the dark, right away, I got “that feeling.” Yup, it was the same feeling I had when I saw 20 Lincoln Street (the building I bought to house the Red Clover Salon) for the first time. I recall placing my hand on the egg-shaped doorknob of the 120-year-old home for the first time like it was yesterday and not eleven years ago. The gut feeling was that I belonged in that space. It is kind of like love at first site when you find the right location. You just kinda of know it when you see it. The reality is that when you become clear about what your true purpose is, it is impossible NOT to move the mission forward. When you are 100% committed to your mission, you burn your boats and make it happen. You have no choice because there is no Plan B. You might modify your methods due to circumstances or hurtles but you never change your destination. The Fearless 13 in all three series have unknowingly encouraged me to take the next step to launch FEARLESS ART WORKS, an art gallery and a space for good works of all kinds! WHAT I LEARNED FROM THIS SERIES ABOUT BEING FEARLESS? Growing is a good problem to have and it presents challenges at the same time. However, listening to one entrepreneur after another walk the walk of growth successfully gives me no choice but to grow myself. All of us, no matter what, are works in progress. The thirty-nine interviews I have completed, and especially this most recent series of thirteen, have given me permission to not have all my ducks in a row. We just jump in and remain forever works in progress. We will never arrive at perfection, we simply keep moving in that direction to the best of our ability. So I jumped and hit the ground running. With a little help from my friends, I have spent about 270 hours getting the gallery good enough to open. I have had 3-4 hours of sleep each night for past five weeks making it happen. If you are my friend on Facebook or like any of my business pages, you have been watching our saga live as we go. Hopefully, the live videos, even though I look a little rough, have inspired you to be fearless as well! Even the first rendition of this blog went out with several typos! I hate typos! As of this afternoon, the glue has been stripped off the floor, a coat of paint has been applied to the walls, the seating area bench has been repaired, a pedestal has been built for my only display case, temporary decals have been placed on the front windows, and the space is clean. As of today – I will be good enough to open. Most importantly, the art is hung on the walls – 89 pieces of my work are up for sale! The only reason to get out of the bed in the morning is to relentlessly pursue our purpose with everything we have. When we believe in our mission, we are driven to achieve it. Entrepreneurs have to deal with their head all the time. Being an entrepreneur is emotional and every single one of us has to manage the rollercoaster ride. If we let our head charge off in any direction unsupervised, we exhaust ourselves. Managing our head space is probably the most important thing we will do every day. I can tell you, the decision to open Fearless Art Works has been an emotional one and not an easy process for me. Opening up a location was distantly on my mind. Although I had said “never again,” as the Fearless Art projects have gained momentum, I knew a space to showcase my work was in my future. I had thought that this plan would be a reality in two years when I had more capital, and I would buy a commercial space instead of leasing one. My family has always owned the building we did business in. There was a huge learning curve for me on the commercial lease part of this deal. I had to immediately learn about commercial leasing and as many of you know – learning about big life changing decisions in real time can be uncomfortable and usually is stressful. I believe I made the best deal possible and I learned a ton about the process that I hope to one day apply to buying my own commercial properties. I will be sharing what I have learned in my blogs in the future for many reasons not least of which is to educate artists about what galleries take on when they lease or own a space. Knowing from personal experience the load a gallery carries to keep the doors open is a very important thing for artists to understand if they choose to show in a gallery. I think understanding that fact will make the commission component feel a little less heavy to some artists. There is no Plan B. I have made a decision. I have opened Fearless Art Works and it is going to be wildly successful. At the end of my life, I will look out over a sea of visual artists, poets, writers, film makers, musicians, community members, charities, and other business owners that I have helped to successfully realize their dreams and the dreams of others. Dispersed amongst them will be collectors of my own art who have homes and businesses full of work that I have created that has been inspired by their own story or the story of others. I will know I showed up with every gift in my life and I will have absolutely no regrets whatsoever. When I meet God at the end of my time on this earth, I will show up empty having used every last bit of me to do what he put me here to do. The friends who have helped me get the doors open! Jayne Van Dyke, owner of Phoenix Quality Cleaning; Shawn Richter, owner of Richter Law; Mark King, owner of American Finest Home Inspection LLC; Sculptor Joanie Wolter, owner of Cuvee Art; Artist Dennis Kleidon, owner of Kleidon & Associates; Dolly Kennedy of the Dolly Steamboat as well as Marty; Tami Holmes, owner of Black Mountain Coffee for all the goodies they provided for the night; and Nick Vigna, owner of Arizona Bartenders. This year’s fearless photographer, Glenn Mire of Mire Images went so far and above the call of duty I cannot recommend him highly enough. The Town of Carefree for embracing me, especially those of you who serve us at the town level including but not limited to Mayor Les Peterson, Vice Mayor John Crane, Gina Kaegi, Gary Neiss, Stacey Bridge-Denzak, Michael Tibbett, Mike Farrar, Michael Krahe and the entire town council. Elena & James Thornton and the Arizona Consortium for the Arts Charity for allowing us to use their projector and sound system tonight, for taking photographs AGAIN but most of all for your incredible friendship and support! Thank mostly to the Raskin’s for presenting a good idea and for helping me to make it happen! Meeting Bruce & Kimberly Raskin has changed the course of my life and that is no small thing. I expect between 150-300 folks to arrive today at 6PM for this show! Now how amazing is that?? Arizona Bartenders is serving complementary beer and wine and our neighbors Black Mountain Coffee is serving us a treat and coffee. Please come if you can and make sure you say HELLO to me!! I look forward to seeing you again at the Art of Fearlessly Doing Business Art III opening on May 5th at Fearless Art Works at Spanish Village in Carefree from 6-9PM. PLEASE NOTE: The Fearless Art Works Website (FearlessArtWorks.com) is currently under development! 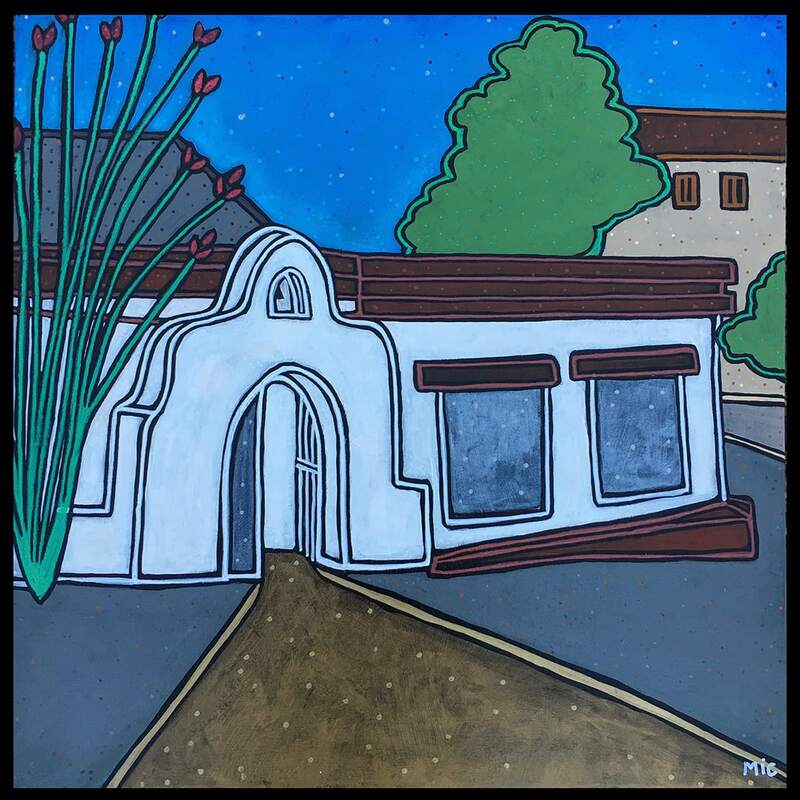 Simply – the storefront of the new Fearless Art Works at Spanish Village where, I will be spending at least the next five years making my (and as many other people as I can) dreams come true. The ART OF FEARLESSLY DOING BUSINESS III series is up for view in it’s entirety through May 26th. OUR NEXT OPENING is on June 1. Check out our calendar to learn more about upcoming 2017 Fearless Art EVENTS.